Following my comments on WOYWW I was prompted to put up pictures to show the progress of the Christmas puddings. I'm not sure how interesting this will be, but here goes. 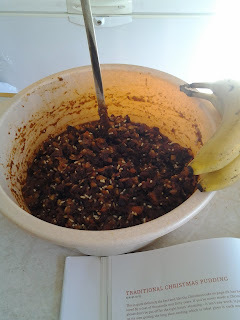 For those who are unfamiliar with the idea, a Christmas pudding is a mix of fruit, with a small amount of flour eggs and a fair amount of alcohol, for flavour only. 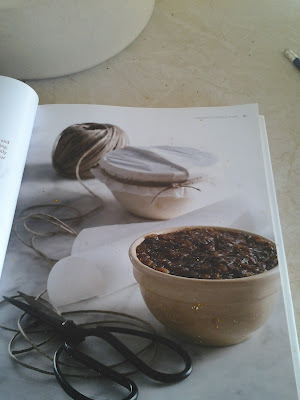 It is cooked very slowly for a long time and produces a very dark rich pudding which is served with cream or custard or brandy/rum butter or demerara sugar; or all of the above. It is very indulgent, very full of calories and by the far the best part of Christmas dinner for many people. Other people dislike it intensely and prefer something tame like trifle after their Christmas dinner. The bananas are just to give some idea of size. Usually it is made well in advance of Christmas as it improves with keeping, hence I am making it at the beginning of November. Some people would say that I am rather late making it as many think it should be made at the beginning of October. It always seems to be large quantities too. 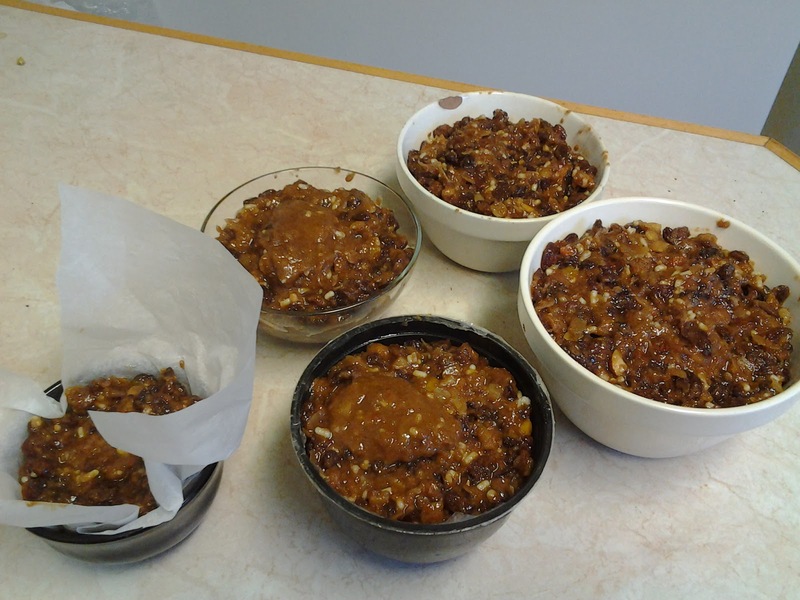 As a family we often find that we can't all be together on Christmas day so we make more than one pudding and have them available for second or even third 'Christmases'. For that reason I doubled the mixture that Delia gave for one pudding, and mixed it in a washing up bowl. And of course it made far more than the two puddings I had planned. It made one large, three medium and one very small. I was rather limited by the bowls I had. Once cooked the puds will stay in the bowls until we are ready to eat them and I couldn't sacrifice all my standard pudding bowls for three months. 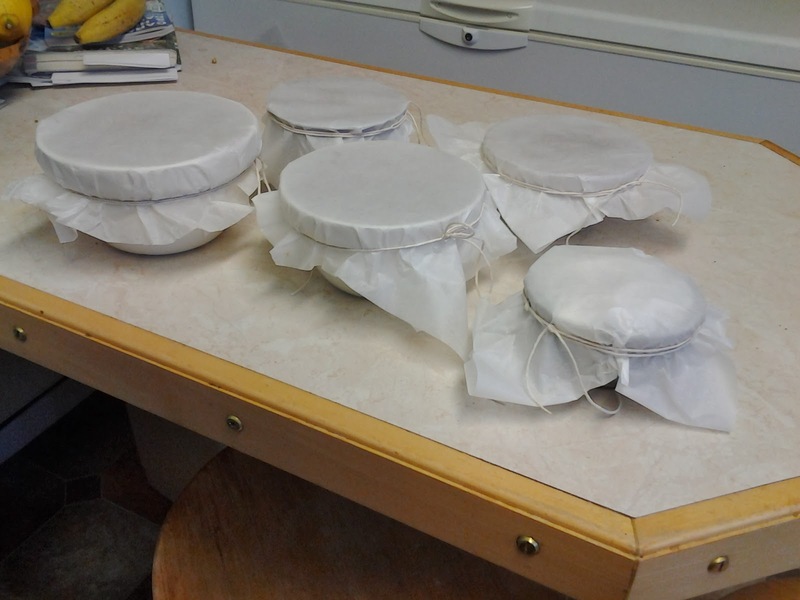 And here they are all wrapped up ready to be steamed for 8 hours. 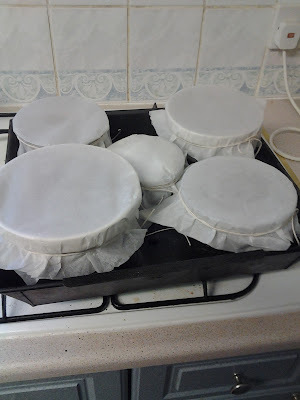 I normally put them in the pressure cookers, but couldn't get 5 in two cookers, but had read on the web that I could steam them in a bain marie in the oven. So I loaded them all into the largest oven tin I possessed, half filled it with boiling water and then found that I couldn't lift it. Very dangerous with all that boiling water in it. So then I had to transfer it all to two smaller baking tins, cover them all with foil and put them in the oven for eight hours, all except the tiny one which came out after 4 hours. Ooh the house smelled wonderful, I set the timer on the oven and went off to bed and lay there getting fat on the delicious smell. Sorry the pics ran out at this point, because there wasn't really any more to show. when they came out of the oven this morning they looked very much like they had when they went in. Because they are wrapped up adn stay that way there is nothing more to see until Christmas day. 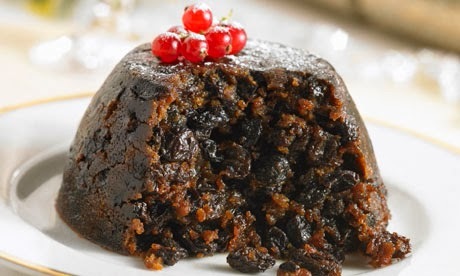 However for those who really have no idea about Christmas pud, I have included a picture from Google images, just to show you what one looks like when it is served. I've no guarantee that my pud will look like this, but it will be pretty similar, I hope. And does anyone know where the title of my post comes from? Just like my mum used to make them! Steaming with a tea towel tided up with string! There'd always be a sixpence in there somewhere! Yes Google+ do seem to want to 'know' everything about you, all the things you're told NOT to put on the internet, age, maiden name date of birthday... it found mine out even though I didn't tell it. Have a crafty weekend! Happy Late WOYWW! Well done, Chris - haven't even thought of Christmas puddings yet - still trying to make more cards - up to 70 now!! I love Christmas pudding - but am almost the only one, so we always have a different sort of pud on Christmas Day - whenever that is, being dependent on when the family are up! Hope they taste good. Agatha Christie is your answer, I think. This looks yummy! I might have to try this next year. I imagine yours will look and taste great!